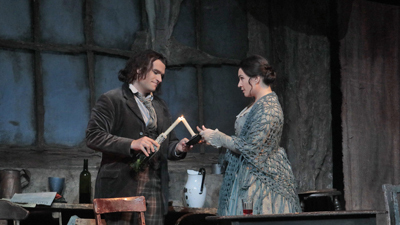 Puccini’s beloved tale of Parisian Bohemian life—with its colorful locales and characters—is just as popular with singers as it is with audiences. Star soprano Anna Netrebko is the poor seamstress Mimì who falls for her handsome poet neighbor, Rodolfo (tenor Piotr Beczała). Meanwhile, Rodolfo’s friend Marcello (Gerald Finley) rekindles his raucous romance with the flirtatious Musetta (Nicole Cabell). The four go through the ups and downs of love and loss, joy and regret, until Mimì’s death brings the opera to a shattering close.